Ever had a margarita on an empty stomach before a meal? Yeah, me too. We made our way to Brixton on a muggy, grey, somewhat depressing June day, one of those that leaves you wondering why you haven’t moved to the south of Spain yet. The temperature was unexplicably oscillating between unpleasantly chilling and uncomfortably warm and the air had a sticky, heavy quality to it. Brixton seemed like a good bet. Brixton Market and Village have a charming rawness to them that makes them a little more special that many other ‘foodie’ markets in London. Less polished, messier, the bustling markets are real in a comforting way, with bright red chunks of meat next to iridescents fillets of fish and plastic bowls full of fruit and vegetables. Trendy-looking cafés with signs in typewriter fonts mixed with neon-lit wig shops. You don’t just go to Brixton Market for your artisan coffee and raved-about dim sum; you also go to buy some apples and a broom. Armed with very little patience and the heaviness of a muggy day, I quickly gave up the idea of eating at Mama Lan when I saw how busy it was. We then roamed around the markets for a bit, peaking inside greasy spoons with plastic chairs and sticky tables and clean-looking cafés serving eggs in every shape and form until I finally laid eyes on the sign of ‘Casa Morita’. Coloroful interiors, charming service and a cocktail list that looked both appealing and cheap, I ordered a Mezcal Margarita with salt on the rim. It was beaitifully smoky and zingy, and pretty potent on an empty stomach. After that, everything had a lovely glow and the menu seemed a little too long (it’s really not) and the font too small to read it properly. Uncapable of actually choosing a dish, we opted for the tasting menu, without actually reading any of the items on the list. In my tipsy state, a succession of colourful and carb-heavy dishes on dainty blue-rimmed lates was very welcomed and we devoured them while smiling and nodding enthusiastically and taking loapsided pictures. The chicken tostada was delicious and had a melt-in-your-mouth texture. It was perfectly balance by crunchy salad, tangy sour cream and fresh, sun-ripe tomatoes. 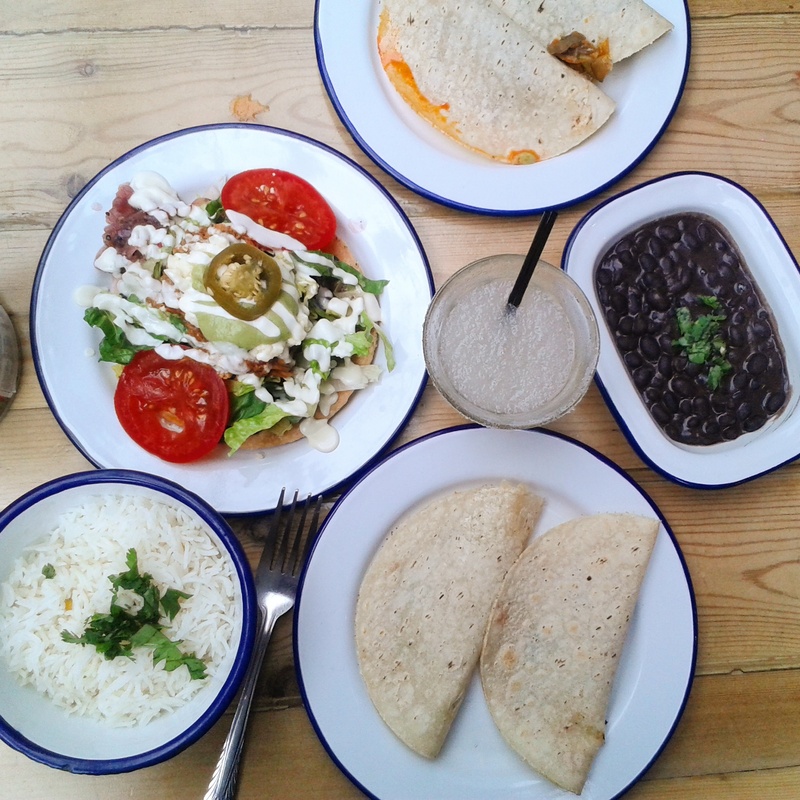 The tacos were a good balance of bright, tart freshness (guacamole) and deeper flavours, like the chicken mole one, with a generous chocolate kick. I ordered a second cocktail – Pepin Mentado – made with Mezcal, cucumber and mint. I was enjoying the subtle, aromatic mintiness and the cool earthness of cucumber, when the plate pictured below appeared. It had everything I love on it: crispy tortilla chips that have just come out of the oven rather than a bag; ground spicy chorizo in a tomatoey sauce; coriander and creamy queso fresco, an egg (because everything is better with an egg on top, right?). It was soothing, crunchy, crispy and immensely satisfying. Bowls of refried beans and corn studded rice were faithfully by our side, ready to soak up the thin tomato sauces. 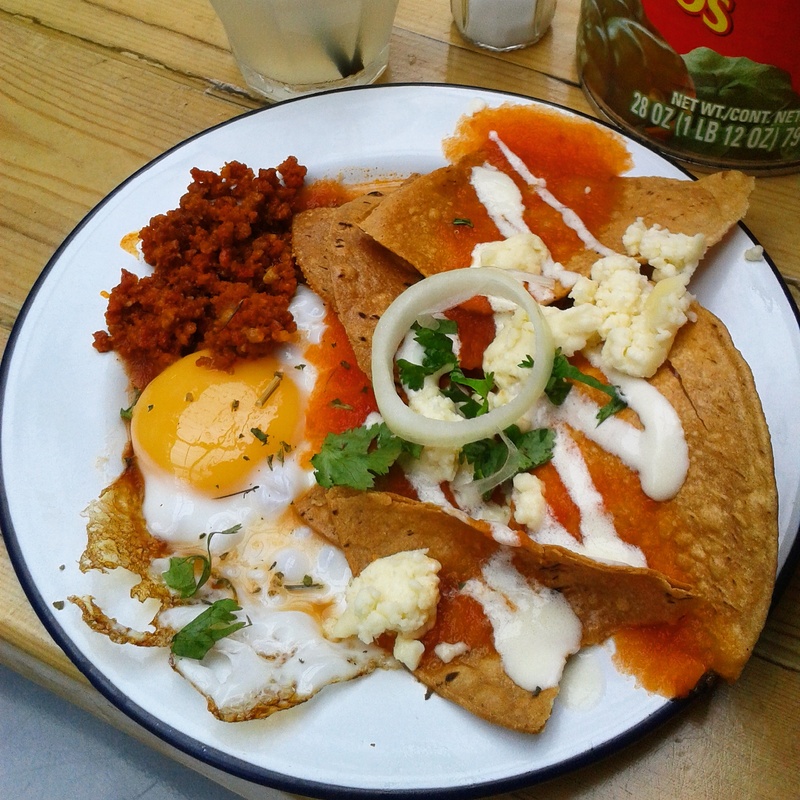 There was saltiness from the rim of the margarita glass and tomato sauce dripping from tortillas and orange yolk oozing on a plate, and the herbal aromaticness of fresh coriander and it all seem to colour the air, and the sky wasn’t quite as grey as before and I ordered another margarita.